‘Weird Tales’ launched in March of 1923 and the world was never the same again. While pulp magazines had been around for some time, ‘Weird Tales’ was the first pulp magazine to specialize in supernatural fiction. ‘Weird Tales’ single-handedly created the field of genre fiction as we know... read more it. No longer did readers of Fantasy, Science Fiction, and Horror have to seek out single stories in otherwise mundane magazines; now they had a magazine all of their own that published only the stories they wanted to read. 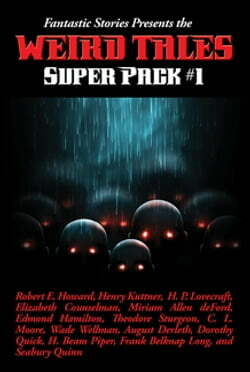 Collected in this anthology are over two hundred thousand words and more than five hundred pages of some of the greatest stories ever published in the pages of ‘Weird Tales.’ Included are: ‘Beyond the Black River’ by Robert E. Howard; ‘The Secret of Kralitz’ by Henry Kuttner; ‘The Shunned House’ by H. P. Lovecraft; ‘Way Station’ by Mary Elizabeth Counselman; ‘Never Stop to Pat a Kitten’ by Miriam Allen deFord; ‘The Diary of Philip Westerly’ by Paul Compton; ‘The Door Into Infinity’ by Edmond Hamilton; ‘Isle of the Undead’ by Lloyd Arthur Eshbach; ‘The Perfect Host’ by Theodore Sturgeon; ‘Gainful Employment’ by Jamie Wild; ‘The Tree of Life’ by C. L. Moore; ‘Mop-Head’ by Leah Bodine Drake; ‘The Golgotha Dancers’ by Manly Wade Wellman; ‘The Medici Boots’ by Pearl Norton Swet; ‘The House in the Valley’ by August Derleth; ‘More than Shadow’ by Dorothy Quick; ‘In the Dark’ by Ronal Kayser; ‘Dearest’ by H. Beam Piper; ‘Doom of the House of Duryea’ by Earl Peirce, Jr.; ‘The Mississippi Saucer’ by Frank Belknap Long; ‘Mask of Death’ by Paul Ernst; ‘The Ring of Bastet’ by Seabury Quinn; ‘Tiger Cat’ by David H. Keller; ‘Old Mr. Wiley’ by Greye La Spina; ‘The Long Arm’ by Franz Habl; and ‘The People of the Black Circle’ by Robert E. Howard.